Hello and thank you for stopping by for the La Conner blog tour! I was honoured to be asked by Jera to participate in this tour celebrating her gorgeous new collection, La Conner. My four legged friends in the background were wondering what I was up to! La Conner was designed by Jera Brandvig (Quilting in the Rain) for Lecien. 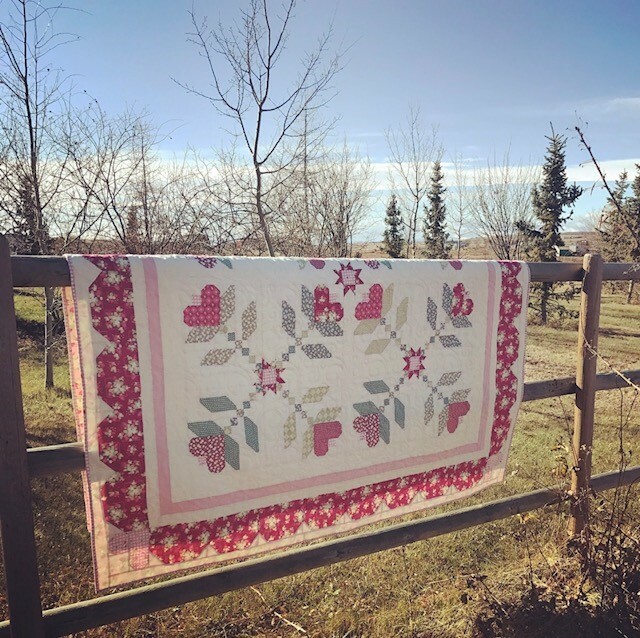 When Jera first started sharing images of her new fabric, I was completely in love. I have to say, however, that the fabric is even prettier in person! The sweet prints, the beautiful colours, and my favourite, the hints of gold (if you look closely at my photographs, you can see these golden specks in the strawberry prints-love!). When I first found out I was going to be part of the blog tour, I started thinking about which pattern to make. I had several in mind, but the very day the fabric arrived, I saw a new pattern on Instagram. It was called Sweet Sixteen by Lea Anne Brummett of Podunkpretties. It was meant to be! I used the Espresso pantograph for the quilting design. I think this quilt pattern would lend itself beautifully to custom quilting, as well. I had such fun making this quilt. 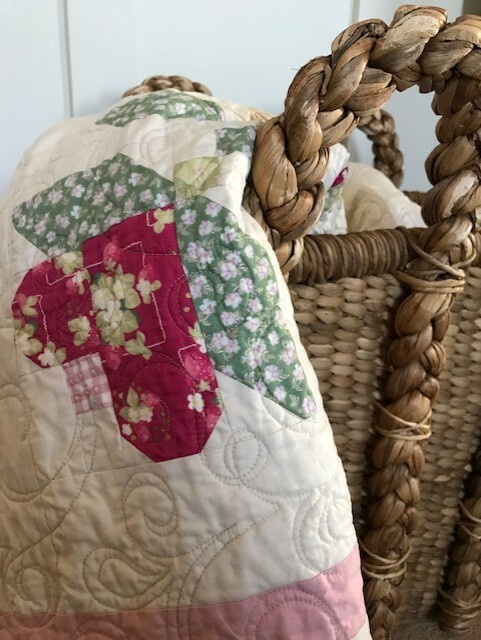 My children call it a Christmas quilt, and my husband thinks it's a spring quilt. I think it's great for any season! The strawberry motif certainly brings a spring/summer vibe, yet the red and green colourways are perfect for Christmas projects. I don't think anyone will complain if I leave it out year round :) I am super excited for my next La Conner project which will include the gorgeous blues in the collection! Can you see the gold dots? So fun! This strawberry print (in any of the colourways) is my favourite of the entire collection. While most of you know my website as primarily a Tilda shop, I also love many other designers and fabrics. Jera is certainly one of the designers I love, and I can't wait to see what she has up her sleeve for us next! Thank you for stopping by, and don't forget to visit all the past and upcoming projects on this fun tour!